Eclipse Micro-Needling Skin Resurfacing: Preparing For Your Treatment - Doctor Hermann M.D.,P.A. Does tired, dull, damaged skin stare back at you in the mirror? If so, it is a sign that the aging process and harmful environmental factors have combined to deteriorate your skin quality and appearance. Fortunately, it’s pretty simple to reverse that damage and restore vitality to your skin. 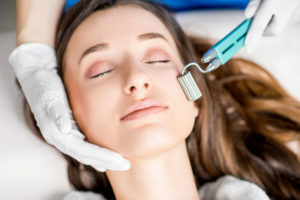 Microneedling is a powerful treatment that resurfaces the skin by triggering accelerated healing, which is why it’s considered one of the best-kept secrets in the beauty industry. Here’s what you should know about preparing for your own Eclipse Micro-Needling skin resurfacing treatment before the holidays. Microneedling is a non-surgical cosmetic treatment that creates tiny, controlled injuries to stimulate healing deep in the dermis. This comfortable and simple procedure uses an Eclipse Dermapen with 12 tiny, painless needles. As the Micropen glides across your skin, the points create controlled injuries at various depths in your skin. This stimulates the body’s natural reaction to produce collagen, growth factors, and cytokines to fill and heal the wounds. Though you can’t even feel the injuries that microneedling creates, those injuries immediately initiate collagen and elastin synthesis that makes it possible for the skin tissue to regenerate and heal. Everything from skin tone and texture to wrinkles and pitted acne scars can be treated with microneedling! Microneedling is a simple treatment, so you don’t need to worry about much preparation. Make sure you arrive at your appointment with clean skin, and prepare to relax while your skin experiences total rejuvenation. It’s even possible to combine your microneedling treatment with another cosmetic tool like PRP injections to supercharge results. When you visit Hermann Wellness in Tampa or St. Petersburg, Florida for your Eclipse Microneedling treatment, Dr. Hermann will work with you to create a tailored regimen. Many patients benefit from 2 to 3 aggressive treatments to address fine lines and wrinkles. About 5 to 6 Dermapen treatments offer the most dramatic results for general skin revitalization, while 6 to 8 treatments make it possible to heal acne scarring. Call now to schedule your Tampa Dermapen skin resurfacing treatment by calling Hermann Wellness at (813) 773-8214.